Watchmen: Tales of the Black Freighter / Under the Hood :: Movie Information :: RabbitTV GO! Tales of the Black Freighter is a CG animated short written and directed by Zack Snyder. As superhero Dr. Manhattan abandons Earth, enabling the city to be destroyed, a young boy reads a survival tale about a doomed sailor who goes mad while returning home from being marooned. Also included are three ground breaking bonus features: Under the Hood: A live action docu-style look at the Night Owls autobiography detailing the establishment and disbandment of the group of superheroes known as THE WATCHMEN. 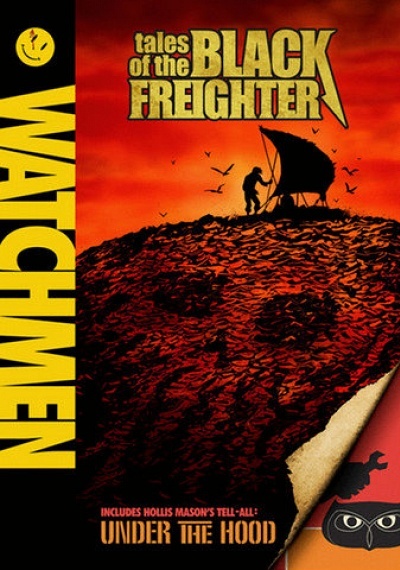 Story within a Story: The Books of Watchmen: This feature weaves through the Black Freighter and Under The Hood to explore how the comic-within-a-comic acts as parallel commentary. This piece reveals profound insight into the Watchmen story for new fans who have not read the graphic novel. Watchmen Motion Comic Episode1: A retired costumed crime fighter is murdered, and one of his old sidekicks believes he was on a hit list of superheroes to kill.